SUBHEAD: We need to share our experiences of beauty, of sorrow, and of love for our land, so as to infect others with the same. 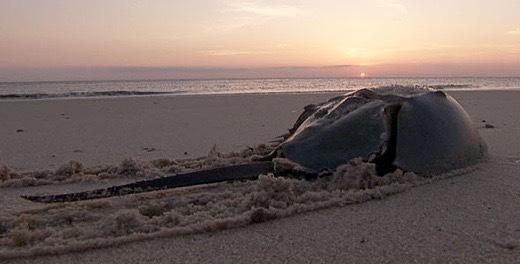 Image above: Horseshoe crab walks on the sand near shorebreak. From (http://planetanimalzone.blogspot.com/2012/05/horseshoe-crab-limulus-polyphemus.html). We didn’t see any horseshoe crabs on this visit. They are a rare sight here now. I don’t know if that is because people killed too many of them, or because of the general deterioration of the ecosystem. Maybe the horseshoe crabs are sensitive to one of these, or maybe the creatures they eat are, or it could be that the sensitive one is a microorganism that reproduces on a mollusk that lives on kelp serves some important role in the food chain that feeds the horseshoe crab. This quality of complex systems collides with our culture’s general approach to problem-solving, which is first to identify the cause, the culprit, the germ, the pest, the badguy, the disease, the wrong idea, or the bad personal quality, and second to dominate, defeat, or destroy that culprit. Problem: crime; Solution: lock up the criminals. Problem: terrorist acts; Solution: kill the terrorists. Problem: immigration; Solution: keep out the immigrants. Problem: Lyme Disease; Solution: identify the pathogen and find a way to kill it. Problem: racism; Solution: shame the racists and illegalize racist acts. Problem: gun violence; Solution: control guns. Problem: climate change; Solution: reduce carbon emissions. Problem: obesity; Solution: reduce caloric intake. You can see from the above examples how reductionistic thinking pervades the entire political spectrum, or certainly mainstream liberalism and conservatism. When no proximate cause is obvious, we tend to feel uncomfortable, often to the extent of finding some reasonable candidate for “the cause” and going to war against that. The recent spate of mass shootings in America are a case in point. Liberals blame guns and advocate gun control; conservatives blame Islam, immigrants, or Black Lives Matter and advocate crackdowns on those. And of course, both sides especially like to blame each other. Superficially it is obvious that you can’t have mass shootings without guns, but that assignment of cause bypasses more troubling questions that don’t admit easy solutions. Where does all that hatred and rage come from? What social conditions give rise to it? If those persist, then does taking away the guns really do much good? Someone could use a bomb, a truck, poison… is the solution then a complete lockdown of society, a society of ubiquitous and ever-increasing surveillance, security, and control? That is the solution we’ve been pursuing my whole lifetime, but I haven’t noticed people feeling any safer. Learning of the die-off of the estuary, I myself felt the impulse to find the culprit, to find someone to hate and something to blame. I wish solving our problems were that easy! If we could identify one thing as THE cause, the solution would be so much more accessible. But what is comfortable is not always true. What if the cause is a thousand interrelated things that implicate all of us and how we live? What if it is something so all-encompassing and so intertwined with life as we know it, that when we glimpse its enormity we know not what to do? That moment of humble, powerless unknowing where the sadness of an ongoing loss washes through us and we cannot escape into facile solutioneering, is a powerful and necessary moment. It has the power to reach into us deeply enough to wipe away frozen ways of seeing and ingrained patterns of response. It gives us fresh eyes, and it loosens the tentacles of fear that hold us in normality. Of course, in those instances where cause and effect is simple and we know exactly what to do, then the quick escape is the right one. If you have a splinter in your foot, remove the splinter. But most situations are more complicated than that, including the ecological crisis on this planet. In those cases, the habit of rushing to the most convenient, superficially obvious causal agent distracts us from a more meaningful response. It prevents us from looking underneath, and underneath, and underneath. When I wondered about the cause of the estuary die-off, an hypothesis may have jumped into your mind – climate change, the culprit du jour for nearly every environmental problem. If we could identify one thing as THE cause, the solution would be so much more accessible. As I was doing research for my book, I googled “effect of soil erosion on climate change,” and the first two pages of results showed the converse of my search – the effect of climate change on soil erosion. The same for biodiversity. No doubt it is true that climate change exacerbates all kinds of environmental problems, but the rush to name a unitary cause to a complex problem should give us pause. The pattern is familiar. Do you think the “fight against climate change,” which starts by identifying an enemy, CO2, will bring better results than the War on Terror, the War on Drugs, or the War on Poverty? Now I am certainly not saying that eliminating fossil fuels is an “easy, false solution.” It does not represent as thorough a change, however, as the change required to halt ecocide here, there, and everywhere. Conceivably, we could eliminate carbon emissions by finding alternative fuel sources to power industrial civilization. It may be unrealistic upon deeper investigation, but it is at least conceivable that our basic way of life could continue more or less unchanged. By the same token, the phenomenon of climate skepticism attests to the possibility of disbelieving in anthropogenic global warming entirely, since it requires that we unify multiple phenomena into a single theory that depends on the authority of scientists. No such faith is required to believe something has happened to the Narrow River estuary, or one of the destroyed places from your own childhood. It is undeniable and has the power to penetrate us deeply whether we “believe in” something or not. It may sound like I am advocating refocusing on local environmental issues at the expense of climate change, but this is a false and dangerous distinction. As I have researched climate change, it has become increasingly apparent that the contribution of deforestation, industrial agriculture, wetlands destruction, biodiversity loss, overfishing, and other maltreatment of land and sea toward climate change is far greater than most scientists had believed; by the same token, the capacity of intact ecosystems to modulate climate and absorb carbon is much greater than had been appreciated. This means that even if we cut carbon emissions to zero, if we don’t also reverse ongoing ecocide on the local level everywhere, the climate will still die a death of a million cuts. Contrary to the presupposition implied in my aforementioned google search results, the global depends on the health of the local. There may not be any global solution to the climate crisis, except to say that we need, globally, to restore and protect millions of local ecosystems. We might, therefore, be wary of hurrying to implement globalized solutions that entail giving even more power to global institutions. Indeed, global carbon policies have already generated much ecological damage from hydroelectric and biofuels projects. If everyone focused their love, care, and commitment on protecting and regenerating their local places, while respecting the local places of others, then a side effect would be the resolution of the climate crisis. If we strove to restore every estuary, every forest, every wetlands, every piece of damaged and desertified land, every coral reef, every lake, and every mountain, not only would most drilling, fracking, and pipelining have to stop, but the biosphere would become far more resilient too. But where does such love, care, courage, and commitment come from? It can only come from personal relationship to the damage being suffered. That’s why we need to tell stories like Stella’s. We need to share our experiences of beauty, of sorrow, and of love for our land, so as to infect others with the same. I am sure something stirred in you at Stella’s words, even if your own childhood was in the mountains not the ocean. When we transmit to each other our love of earth, mountain, water, and sea to others, and stir the grief over what has been lost; when we hold ourselves and others in the rawness of it without jumping right away to reflexive postures of solution and blame, we are penetrated deep to the place where commitment lives. We grow in our empathy. We come back to our senses. SUBHEAD: my killing spree with the horseshoe crabs on Fire Island is not the only terrible thing, but one of the most regretted things I have ever done. This article resonated with me as soon as I read the title. When I was fifteen my family rented an old house in the town of Saltair on the bay side of Fire Island (a long narrow barrier island) across the Great South Bay from Long Island. From the wooden walkway in front of the house to the "past its prime' bulkhead holding back the Great South Bay was about twenty feed of sand. Some of that sand, where the bulkhead had lost a few boards run out into the bay and allowed tidal water in behind the bulkhead line. that's where I first noticed a few horseshoe crabs. This was in early June. As a week wore on I found myself fascinated by their increase in numbers. It appeared to be a time of mating. The smaller male crabs would be joined in copulation with the larger females. What ever ideas I had of swimming or playing in these shallow pools behind the bulkhead faded away as the number of mating horseshoe crabs increased. I should mention, if you are not familiar with these creatures, horseshoe crabs are primeval in appearance. Something a brontosaurus might have stepped on. The crabs had a turret like shell over their whole body that covered their legs. There were two bumps on the sides of the shell that looked like eyes, and were in fact light sensitive. tailing the body of the carb was a long, pointed, sharp tail that looks like a menacing dagger. It would be raised like a weapon when the crab was excited or threatened. When I examined the bay side of the bulkhead I found that the crabs were in what only be called an infestation. Only a few years earlier our neighborhood in Levittown, Long Island had had an infestation of Japanese beetles. Every flower in our yard had a half a dozen beetles devouring its petals. Before they brought in the DDT trucks ten year old kids like me were paid to kill Japanese beetles for 20¢ a jelly jar full. To me the crabs were a bigger more horrible infestation. And so I began killing them in the salt water pools behind the bulkhead in front of our house facing the Great South Bay. It was an endless task. I would crush in their "foreheads" with a rock or any other devise that would break their shell. The females broken shells would leak a viscous fluid with turquoise eggs the size of mustard seeds. As I worked I noticed another fellow teen who lived a couple of houses east of mine. He watched me for a while and then joined in the carnage. We worked as if we were being paid for it. Coincidentally, he was born on the same day I was (5/28/1945). He was the only person I knew who was exactly my age. At some point I found a 2x4 that was about six feet long with a heavy nail toe-nailed into one end, such that the sharp point of the nail protruded from the end by a few inches. With a little effort I was able to straight the nail so it straight out of the end of the 2x4. With this new device I mounted the narrow bulkhead wall. The water on the bay side was two to three feet deep. The 2x4 helped me balance on the wall where there wasn't sand behind it. As I prowled the wall I was not surprising to find the Bay side of the bulkhead still teaming with horseshoe crabs. Killing them all was going to be impossible. All I though I could do was clear the area in front of my house. After working for a few days I realized even that was going to be impossible. The result of my horrific fixation was a lot of dead, stinking horseshoe crabs... a sense of self loathing. I spent many more summers sailing to various parts of the Great South Bay but never saw another "infestation" of the crabs - this may be because they require eleven years to mature. Horseshoe crabs have roamed the muddy bottoms of salt water harbors and bays for over 300 million years, a time in which the giant prehistoric reptiles and mammals have come and gone. But unlike the dinosaur and mammoth, the horseshoe crab survives today, a living fossil, which fascinates children at the seashore. But today his long life is being threatened as he is destroyed wholesale by people who do not understand his value in the ecology of the marine life of the shallows. In story form, The Crab from Yesterday details the history and life cycle of a horseshoe crab from its beginning when eggs are deposited on sandy beaches to the reaching of full maturity in the coastal shallows. Young readers, like the boy in the story, will learn that even though some animals lack wagging tails, sticky tongues and happy faces, they can be interesting and appreciated too. From "The Crab of Yesterday" by John F. Waters (http://www.paperbackswap.com/Crab-Yesterday-Life-John-F-Waters/book/0723260850/). It never occurred to me that the horseshoe crabs had been coming to the Great South Bay since the glaciers retreated at the end of the Ice Age and created Long Island and its environs. Looking back, my killing spree of horseshoe crabs on Fire Island is not the only terrible thing, but one of the most regretted things I have ever done.